Drivers in Shrewsbury will enjoy smoother journeys thanks to a new multi-million pound relief road approved today (21 March 2019) by Transport Secretary Chris Grayling. The Department for Transport is providing £54 million for the North West Relief Road – between Battlefield Link Road and Oxon Link Road - which will provide a new, single-carriageway route taking traffic out of the town centre. This will not only significantly reduce congestion, but it will also lead to improved air quality in the town centre. "The North West Relief Road is just what Shrewsbury needs to reduce congestion in and around the town. "We are investing £54 million in this exciting new scheme, helping drivers get from A to B more quickly, while improving air quality for residents." 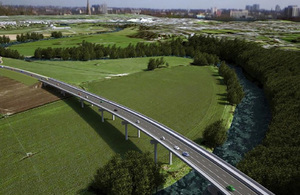 "This announcement is brilliant news and means that our thorough and detailed business case for a Shrewsbury North West Relief Road has been recognised and supported by the government. Today’s announcement really is the culmination of many years’ hard work by a great number of people and it’s been a real team effort between council officers, councillors, MPs, our engineering consultants and many more. "The North West Relief Road will benefit not just Shrewsbury but the whole of Shropshire and, though there is some way to go before the road is built and in use, securing this funding from the government is a huge step towards making this much-needed road a reality." This is in addition to a £1.8 billion investment in improving motorway and schemes across the Midlands, as well as providing £176 million in the past year for road maintenance and small transport projects.